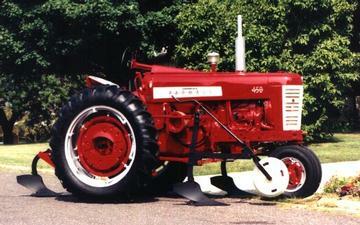 This tractor was purchased for 4100 Dollars at a farm retirement auction at Fairbury IL. The retiring farmer paid 1400 Dollars for it 1962 at a farm retirement auction at El Paso IL. I purchased the IH Number 22A three furrow middlebuster for 150 Dollars in 1996 from a cotton farmer at Waxahachie TX and bought the 'correct' tractor to mount it on in 1997. Total invested to year 2001 is over 9400 Dollars. This includes 130 Dollars purchased labor and a 2000 Dollar sandblast, prime, and paint job. I claim this is the only tractor with a front mounted middlebuster in Washington IL (and the whole state) until someone shows otherwise. Front mounted middlebusters were widely used in the Texas blacklands as the primary tillage tool for row crop farming. They were used from the beginning of tractor farming to the 1970's and a few farmers still use them. Tractor power required per middlebuster bottom is similar to that for a 16-inch moldboard plow bottom.